Four of the top 10 are different. What’s also striking is that the blog post with the most WordPress views doesn’t even show up on the Google Analytics list (to be fair, it is No. 11), whereas the No. 2 post, according to Google Analytics, didn’t show up on the WordPress list. If you read through how WordPress calculates views and how Google Analytics makes calculations, you would think these would be closer. 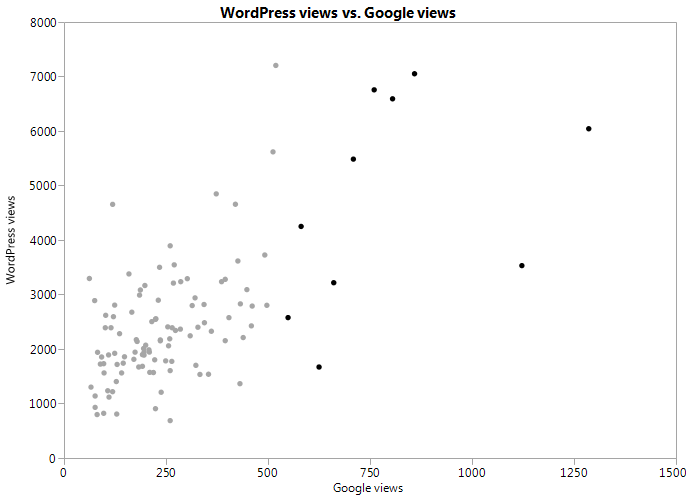 However, taking a look at a scatterplot of WordPress vs. Google views for the JMP blogs from 2014 (top 10 via Google are bolded), we see that’s not really the case. What’s even more alarming is the scale of the number of views. Over the course of the year, the total number of WordPress views are about nine times that of Google Analytics. Any readers with experience between the discrepancies? How do your counts compare? Next time, I’ll take a further look at the data to see if any information can highlight some of these differences.